A honeymoon in Cuba – first stop Havana! | Blog the world!!! Is Cuba worth a visit? In a word toobloominright! Cuba is steeped in history: think Che Guavara and Fidel Castro, think embargos with the US and a long history of Socialism (not Communism? ), and think classic cars and lots of rum. Also it has the most beautiful landscapes, welcoming people and food that’s not too bad. From our first moment in Havana we were welcomed into Cuba’s warm welcoming arms. We were swept from the airport in a sunshine yellow classic car and dropped off at the end of a dark street. I’d have been frightened if it weren’t for the sound of Salsa music coming from the end of the street and the sound of laughter – probably from the tourists attempting to join in with the dancing. In fact, I didn’t worry once in our three week stay – despite its reputation I found Cuba to be one of the safest countries I’ve ever visited. We arrived at an unassuming shabby looking door and rang the bell, this was to be our home for the next few days. This was also the place we realised we no longer knew any Spanish – eeks! We were keen to fight off jet lag quickly so went straight to bed, which after our 12 hour flight was very welcome. We thought about heading straight out into the depths of Havana but just couldn’t quite face it. 22 year old us would be very disappointed. The next morning we awoke to the sounds of chatting in the street below. As we slowly got ourselves up and opened the curtains we were greeted by blazing sunshine (it was monsoon season so we weren’t sure what to expect). 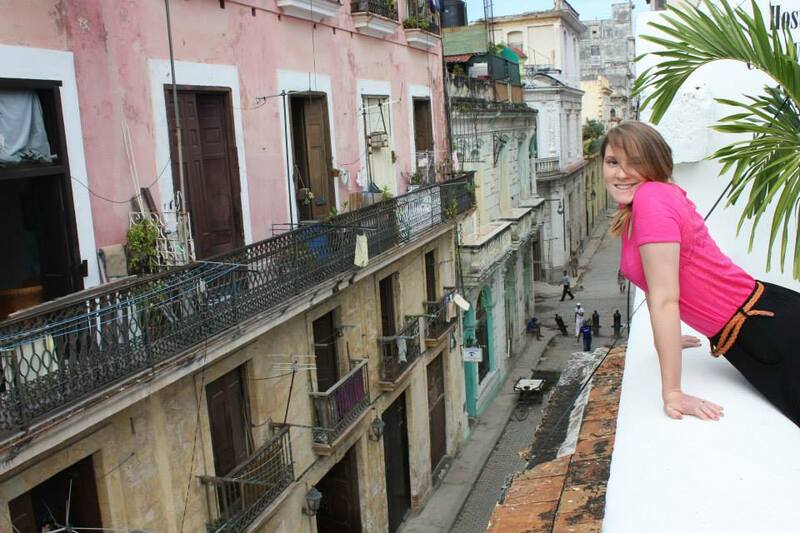 We stepped out of our room onto a large roof terrace, decorated exactly as you’d hope for a Havana hostel. Quotes adorned the walls and colourful lights strung across ready for the nighttime. We peered over the wall and down on to the quietly bustling street. To our left we could see the main square already busy and full of people soaking up the ambiance. A moment later a smiley lady appeared asking about eggs and shortly after that our breakfast arrived. Plates of fruit and eggs were more than welcome as we hadn’t eaten since the flight. I have to say if you’re heading to Havana and you can get booked in, the 1984 casa is truly a fantastic place to stay. After our breakfast we hit the streets, this is where the next few days become a bit hazy (partly because of the rum, mainly because this was a year ago now and I have just been too disorganized to finish a blog in this time) – so here’s a little run down of some of the things we enjoyed in Havana. 1. Pina Colada in the Hotel Nacionale De Cuba. The hotel is something special on its own, steeped in gangster history, walls adorned with photos from a Havana ran by US mobsters and gambling, political people shaking hands with famous mobsters and stars from the ratpack. Its décor, much like lots of things in Cuba was straight from the 1950s, literally (built in 1930 but at the height of its fame in the 50s). It was a magnificent building, filled with interesting artefacts, even better it makes THE best pina coladas in all of the world! 2. Mojitos in La Bodeguita – as Hemmingway claimed, the mojitos really are something special… and strong! This tiny bar was our favourite in Havana, live music played throughout the day and the atmosphere was electric. I think it may have had a second room but we stayed in the bar and would have stayed longer if it weren’t for the rum going to our head and our need for food. 3. Daquiris in Floridita – another of Hemmingway’s favourites, we headed there to sample the Daquri. It was fruity, fresh and strong, just the way all famous writers should like it. We’re neither writers, nor famous but we enjoyed it all the same. This bar is quite touristy and big but it’s worth a visit all the same. 4. Museo de la Revolucion – a fantastically informative (but probably one sided) museum dedicated to the revolution. This was once the presidential suite for Batista (the last president who was chums with the mob and responsible for gambling and drugs becoming rife in Cuba) and still has the bullet holes from the day the revolution arrived. It teaches you everything you need to know about why the revolution happened and the ideals of Guevara and Castro. 5. Dancing in the street, in bars, just about everywhere – wherever you go in Havana, you will hear music. Dancing is a part of life in Cuba, locals and tourists alike will join in, it will start with a foot tap and before you know it you’ll be swaying your hips with all the grace of a lame elephant, but don’t worry, nobody will laugh.